Attend a Special Introduction Event Coming Spring/Summer 2017. A single event can awaken within us a stranger totally unknown to us. Attending a free, in-person Introduction to awaken Forums is your opportunity to get your questions answered. 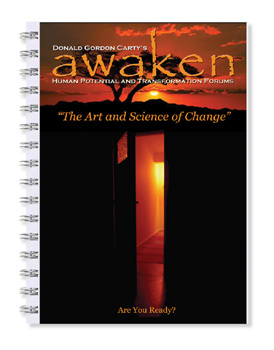 During the Introduction, you will get a sense of what it would be like to participate in an awaken Forum, the profound difference an awaken Forum could make in your everyday life, and how the various courses, seminars, workshops and events are conducted. By using everyday situations and guiding you through thought experiments and exercises, this session is filled with valuable ideas interwoven with inspiring messages, and visual aids. Donald does an excellent job of peeling back the layers and revealing the disconnects in much of our thinking, beliefs, desires, and choices--contradictory beliefs held at the same time with no apparent awareness. Once you have seen your own mind with the filtered lenses removed, it is impossible to remain the same. That is why so many have praised his work as being absolutely life-changing--not just an event--but a transformational experience! Cost: In order to cover the costs in making this event possible, a donation, though not required, would be appreciated. 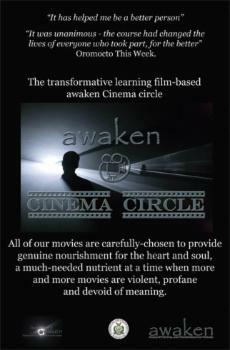 awaken Cinema Circle - Barrie ON - Enrollment begins Spring/Summer class 2017. The awaken Cinema circle relates solely to the meaning making process of the individual's direct experience. "tell me and I will forget, show me and I may remember, involve me and I will understand." We will be bringing you movies that are out of the "norm". These hard-to-find films presented through the awaken Cinema circle will warm your heart, stir your soul and expand your mind. By using everyday situations and guiding you through thought experiments and exercises, these sessions are filled with valuable ideas interwoven with inspiring messages, and visual aids. Donald does an excellent job of peeling back the layers and revealing the disconnects in much of our thinking, beliefs, desires, and choices--contradictory beliefs held at the same time with no apparent awareness. Once you have seen your own mind with the filtered lenses removed, it is impossible to remain the same. That is why so many have praised his work as being absolutely life-changing--not just an event--but a transformational experience! Come, watch, and discuss. EXPERIENCE! The awaken Cinema circle is scheduled to begin again in the November 2016 . For more information including contents and syllabus please visit the awaken Cinema Circle website or Call 850-725-0527.
awaken Cinema circle Course: Eight Weeks - 2 1/2 hours classroom, approx. 3 hours homework/fieldwork per week. 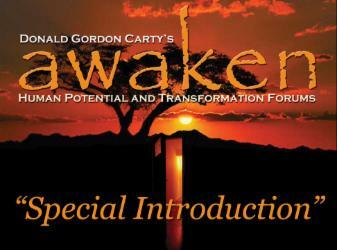 One 1 hour one to one Coaching/Mentoring session per week with Donald Gordon Carty. Cost: $427.00, for complete details please visit the awaken Cinema circle website. Place: Suite Success - TBA, Barrie ON. If this session is full or closed, no worries! Simply fill out the form on our contact page and we will keep you informed of any additional dates and times. Free Movie Screenings on Sundays. Meetup with locals area residents who are interested in studying and practicing the science and ideolgy of The Law of Attraction. You are invited to experience a single event that just may awaken the stranger within you. The "Awaken" discussions will be focused around the Law of Attraction, and will dare the participants to envision, believe and create a new view of themselves and the world around them. Presented through discussion forums focused on blockbuster independent films like The Secret, What the Bleep, One.. the Movie, You Can Heal Your Life and and many more, awaken predicts, the sleeper must awaken. "I can't imagine anybody participating and not feeling changed in a deeply personal way," says Donald Gordon Carty, author and facilitator of the event. "This is going to be a remarkable life changing event for anyone interested in the idea of the mind and how it affects their reality!" Attendees are strongly encouraged to bring their own ideas to awaken each other to a new way of thinking about what it is to be human and what it takes to make life and work more rewarding and fulfilling. A collection of selected topics from the films will be available to help inspire and guide the discussions. Film runtimes; approx. 1 to 2 hours. Discussion, exploration, experiential exercises and support materials; approx. 90 minutes. Total time; 2 hours 30 minutes to 3 hours 30 minutes RSVP. Registration is limited. So register today! Click here to Register and RSVP. One of the most difficult turning points in life is New Years day and during the start of the New Year most people make resolutions about lifestyle changes. How many of us have said something like ‘from now on things are going to be different, I am going to stop smoking, eat healthy, exercise regularly, spend more time with family and friends, quit drinking, enjoy life more, help others, or get out of debt?’ Yet, still filled with good intentions, before January’s end these resolutions either fail or falter. 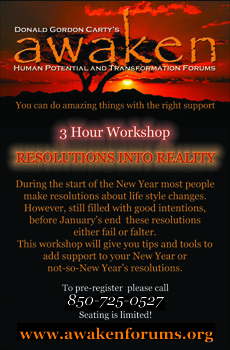 The two-evening “Resolutions Into Reality” workshop, sponsored by the Personal Development Institute and Awaken Forums, will be held over two evenings Tuesday January 27th and Thursday January 29th, 2015 from 6:00pm to 7:30pm and pre-registration is required. Cost: $497.00. Includes Workbook. Please email or call for details. Date: TBA. For Winter Dates go here. If these sessions are full or closed, no worries! Simply fill out the form on our contact page and we will keep you informed of any additional dates and times. People assume that the solutions we’re seeking come from outside ourselves, but it’s important to recognize that some of the problems—as well as their solutions—arise from within us. In other words, it’s about consciousness. The focus of the Conscious Aging workshop series is to invite shifts in consciousness away from self-limitation, lack, isolation, and fear and toward expansiveness, inclusiveness, wholeness, connection, and compassion. · Cultivate a personal roadmap for their own aging journey by deepening their spiritual life and learning to make each moment matter. 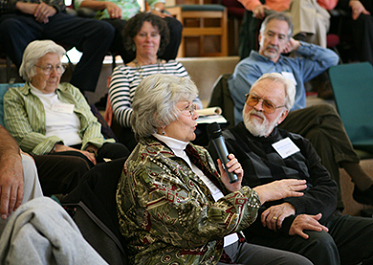 We have found that seniors are yearning to engage in dialogue together on these issues. They are looking for guidance, meaning making, connection, and community to help fortify themselves for their aging years. They will experience all of that and more by participating in this unique program. Conscious Aging Workshops: Eight Sessions - 2 hours classroom. For More Information about Content click here. Cost: $157.00. for the eight session series plus $25.00 for Workbook. Early registration cost: $127.00 for the eight session series plus $20.00 for Workbook. Click Here for additional information. You will be redirected. Copyright 2011, Donald Gordon Carty. Awaken. Canada. USA.